Since the beginning of 2017, 372 thousand passengers have traveled by rail from Helsinki to St. Petersburg. For the first nine months of this year, the Allegro train carried 26% more passengers than the year before – 372 thousand people. This was reported by the press office of the Russian Railways. 42.6 thousand passengers used the train between St. Petersburg and the Finnish capital in September, which is 24% more than in the same period in 2016. 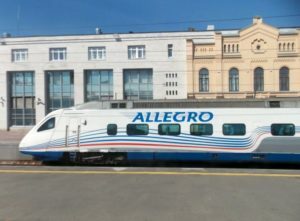 Since December 12, 2010, when the international high-speed service between St. Petersburg and Helsinki was launched, the Allegro trains carried 2.6 million passengers. High-speed train “Allegro” will take you from Helsinki to the center of St. Petersburg in little more than 3.5 hours. Such speed is achieved not only because the train speeds up to 220 km / h, but also due to the fact that documents are checked and customs control is carried out during the trip. This significantly reduces the time spent by passengers. The “Allegro” trains are produced in Italy. The salon is very similar to the salon of the plane – comfortable armchairs, luggage shelves above the seats and soft lighting, air conditioning. Despite the huge speed that the train develops, you will not feel it inside – the train is very smooth. The train offers two classes of service. In any class you will sit in a comfortable armchair with a folding table, adjustable back, leg support and a socket for connecting the charger. But if you bought a ticket to the first class, then your seat will be leather and with a lot of settings, and the cabin is more spacious. On the way, you will be offered cold snacks that are included in the ticket price, and there will be a self-service area with tea and coffee and a fresh newspapers.